Address: Grassmere Estate, Mallital, Nainital, Uttarakhand 263001 India. A sumptuous retreat away from bustling city life yet in the vicinity of The Mall Road, The Manu Maharani-Hotel & Spa is an epitome of cordial regional conviviality and impeccable services. Enhancing the splendid beauty of the pristine Kumaon region, this majestic property boasts of its fascinating interiors, plush upholstery and comfortable furniture in rooms and public places. Grassmere Hall, a well facilitated banquet and glittering alfresco lawns are preferred by localities as well as hotel guests to host successful business meets, seminars, dinner receptions or high-tea get-togethers. Reanimating Olive Spa or modish Gympact fitness club are a delight for residents to refresh themselves after tiring day tours of the town. An enclave of tranquility and serenity, all 67 well appointed guest rooms open up into scintillating panoramas of the placid Lake Naini and the silent valley. 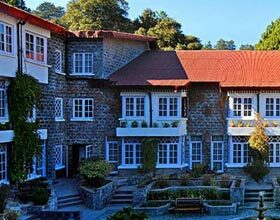 These accommodations at The Manu Maharani-Hotel & Spa Nainital are categorized into Standard Rooms, Premium Rooms, Club Rooms, Terrace Rooms, Duplex Rooms and Suites are facilitated with all day-to-day amenities including central air-conditioning system featuring heating system too. An appetizing culinary delight in the heart of Nainital, diners at The Manu Maharani is an oasis of scrumptious spirited delicacies in the calm auras surrounding the Naini Lake. Walk-in to either of the two adjoining restaurants with gorgeous views of the valley, Gardenia- a chic styled multi-cuisine venue or Panorama- a signature Indian and Chinese restaurant with classic hues drawn from antique interiors. The vintage set-up offering resplendent vistas of Naini Lake at the Viceroy, a bar lounge is relished connoisseurs along with innovative cocktails and classical wines. Cake Walk is an ideal hangout to adore the savory canaps along with refreshing espressos.